You are currently browsing the tag archive for the ‘Albert Barillé’ tag. With ‘L’infini de l’espace’ Albert Barillé rounds up his personal science fiction story, which is the series ‘Il était une fois… l’espace’ (Once Upon A Time Space). After the computer society had brought the constellation of Cassopeia to its knees, it has issued the same ultimatum to Omega. The episode opens with the council of Omega rejecting it, in name of the ‘dignity of man’. Nevertheless, after the gruesome defeat of Cassiopeia in ‘Combat de titans‘ the intergalactic bond knows it doesn’t stand a chance, and most of the episode has an atmosphere of inescapable doom, with an added dose of melodrama. Maestro and Metro set off to try to find a way to penetrate Yama’s strong defense field, but soon Maestro takes a different path, a spiritual one, in which he apparently meets Psi’s mysterious visitors, who are the possessors of the mysterious vessel in episode 1. It’s these mysterious superbeings that finally pop up as a deus ex machina, destroying Yama’s whole fleet with help of an unstable star in a matter of seconds. After the strong apocalyptic build up of the last three episodes, this announced yet all too easy solution comes a bit as a letdown. 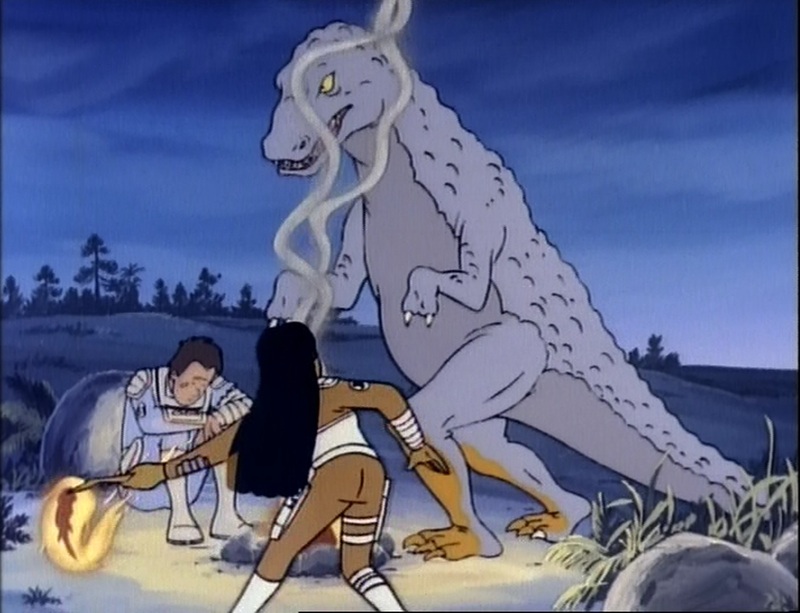 The episode ends with an encounter with the more advanced species, in a scene reminiscent of the great science fiction movies ‘2001: A Space Odyssey’ (1968) and ‘Close Encounters of the Third Kind’ (1977). The aliens tell our heroes that their help in this case was an exception, and that mankind should find its own way to the next, immaterial stage, through a path of kindness, tolerance and wisdom. The series ends with Psi remarking that they themselves had said something of the same kind to the primitive Cro-Magnon people in episode 5. 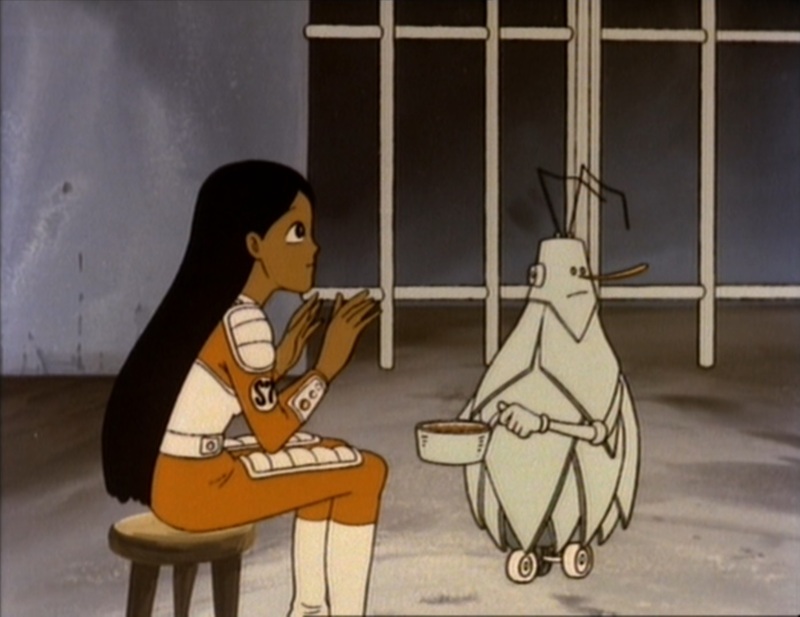 In a way the ethereal aliens are arguably as patronizing as the emotionless robots of Yama had been, but the aliens’ ways show a confidence in and compassion with mankind, which Barillé strongly juxtaposes to the cold reasoned violence of the computer superpower. Thus ends ‘Il était une fois… l’espace’. The series probably has known few reruns, if any at all, and is not as well-known as its successor, ‘Il était une fois… la vie’ (Once Upon A Time… Life), let alone contemporary American series like ‘He-Man and the Masters of the Universe’ or ‘The Smurfs’. Unlike the creators of those latter two series, however, Albert Barillé dared to take children seriously, sharing with them his views on more mature subjects like politics, philosophy, spirituality and mankind itself. I was one of those kids, and I thank him for it. The general’s reaction is to arrest his senate, taking the final step to become a full dictator at last, and to declare war on Yama. Meanwhile on Omega Pierrot conceives a plan to harm the robot enemy from the inside, which he performs not only with the faithful Psi and Metro, but also Le Petit Gros and his girlfriend, Pierrot’s sister. By trickery, the five manage to be brought inside a Yama cruiser, where Pierrot places a bomb. Some excitement is added, when after having placed the bomb the five are having difficulties leaving the ship, especially when Metro forgets an important code. Nevertheless, it’s the politics and the depressing battle scenes of Cassopeia’s ill-fated war that impress the most, not the antics of our heroes. This episode’s images of war and mass destruction are very disturbing, and in no sense Barillé glorifies war, on the contrary. Although they had been the stock enemy in the past, the viewer is invited to sympathize with the Cassiopeians. Teigneux’s admiral is seen repeatedly in utter distress, torn between the general’s bullheadedness and the sheer hopelessness of his own duty, with his subordinates mourning the loss of human lives. Barillé raises the very question what cause would justify such loss, leaving the answer to the viewer. This is a very different take on war than the heroism of Star Wars, and a much more mature one, despite being aimed at children. ‘La grand ordinateur’ completely takes place in the robot city that took flight in the previous episode, ‘Cité en vol‘. First we watch Pierrot and Metro wandering endless corridors in search for Psi. 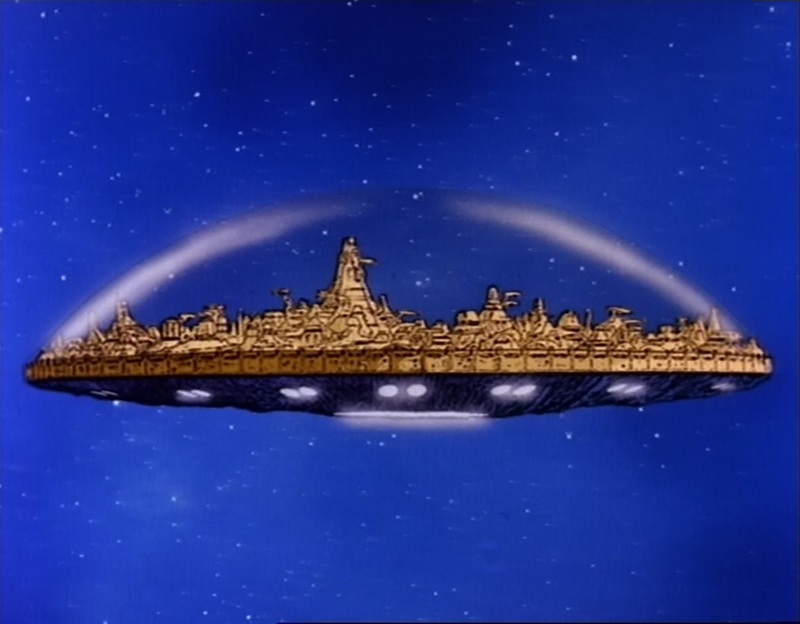 Then the flying city invites Omega’s large space ship inside, which is dwarfed by the gigantic city. Inside, colonel Pierre and Maestro from the ship are soon reunited with Pierrot, Psi and Metro, and we meet the great computer itself at last, which is the robot city of Yama itself. The great computer tells about its origin and how it has been behind every robot scheme in the series (e.g. the robot revolt in ‘La révolte des robots‘, and the doomsday rocket in ‘L’imparable menace‘). It reveals its ultimate plan, which is to stop man from its own inclination to violence. It does so by taking total control of humanity, so “no man will ever know any pain or sorrow again”. In the end the great computer shows its immense war fleet, and sends our heroes back to Omega with its message. This episode is hampered by some odd staging, and at times terrible drawings of our heroes, but it’s also arguably Barillé’s most daring episode: a great deal of it is filled with a philosophical discussion on questions like what makes man human? Is it allowed to sacrifice lives for the greater good? And is violence to end all violence ethical? Bold subjects for a children’s series, indeed! Both the great computer’s reasoning and action are very believable, and its consequences food for thought. It’s ironic how its destructive approach is fueled by a wish to end all violence. It makes it one of the most interesting villains ever put to the screen, especially because it’s not really visible. ‘Cité en vol’ is the third of six episodes, which form the finale of ‘Il était une fois… l’espace’. Meanwhile the humanoids try to get to the secrets of Psi’s psychic powers. As Pierrot reveals to Murdock, if they’ll succeed nothing will be able to stop them. At one point they get help from a Cassiopeian telepath, and he and Psi have a telepathic mind battle, which is a nightmarish variation on the battle between Merlin and Madam Mim in ‘The Sword in the Stone’ (1963). This scene, with its continuous metamorphosis, arguably is the most impressive piece of animation of the entire series, even if it’s still nowhere near the Disney animation that might have inspired it. Although most of this episode is about Pierrot trying to get inside the robot city, it also hints at the real dangers the humanoids form. They call ambassador Le Nabot (Dwarf) a fool behind his back, and continuously refer to a secret plan. At the end of the episode the robot city takes flight, giving the episode its name. This concept Barillé undoubtedly borrowed from James Blish’s science fiction book series ‘Cities in flight’, which appeared between 1955 and 1962. The importance of this event will only be revealed later, but it’s clear that Pierrot made it inside just in time. Unfortunately, it does kill Murdock, the only human being killed on screen in the entire series, a death that made a strong impression on me when I was a kid. ‘Un monde hostile’ is the exciting second of six episodes, which form the finale of ‘Il était une fois… l’espace’. It immediately starts where ‘Les humanoïdes‘ left off, with Pierrot’s ride through the hostile world of Apis. Practically the complete episode is devoted to Pierrot’s journey. Meanwhile Psi is visited by Le Nabot (Dwarf), who’s actually proposing to her. Because Psi’s certain Pierrot will come to rescue her, she accidently reveils that he’s not dead, endangering his life. Le Nabot immediately restarts the search for our hero. He succeeds in destroying their mounts, and Pierrot and his fellow travellers have to continue on foot. Because of its one-dimensional subject (Pierrot is travelling to Murdock’s place throughout the picture), ‘Un monde hostile’ is a little less compelling than the other final episodes. But on the way Sylva provides some necessary background information, which will be expanded upon in the following episodes. 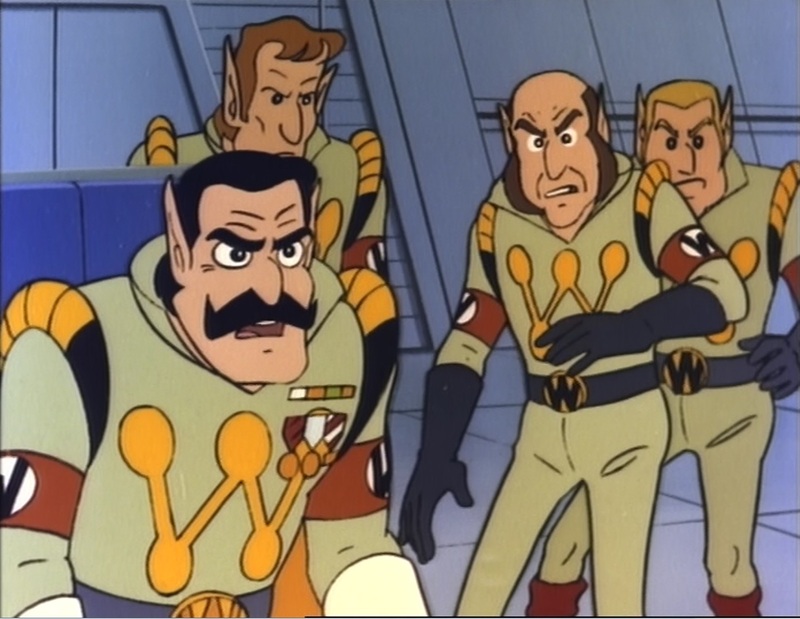 In the opening scene of this episode Pierrot, Psi, Petit Gros and Metro are honored for their heroic deeds in a.o. ‘L’imparable menace‘. 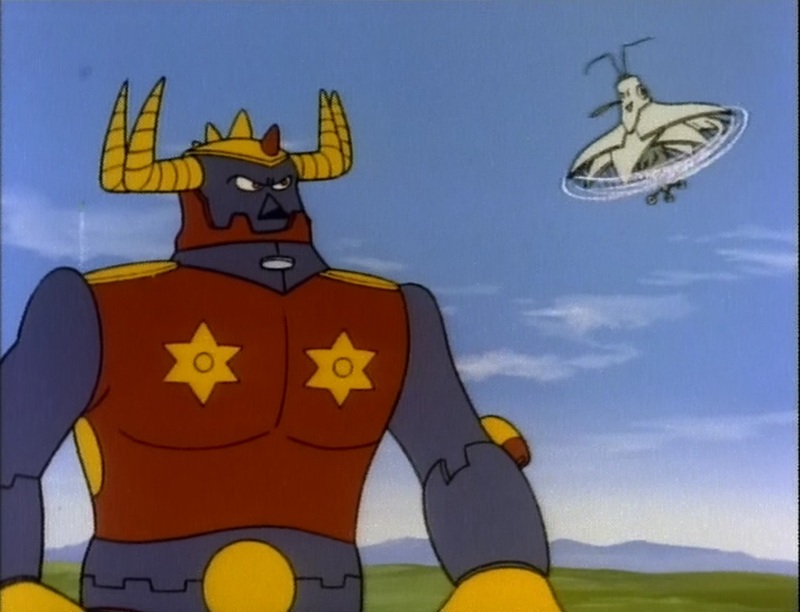 Like ‘La révolte des robots’, ‘La revanche des robots’ is a highly enjoyable episode, with a star role for the matter-of-factly little robot Metro, battling two giant Grendizer (Goldorak)-like robots, with a rather improbable, but scary capability of duplication. In the opening sequence of this episode the brave little robot Metro (who had been destroyed in ‘Les anneaux de Saturne) has been repaired and he joins Pierrot and Psi when they leave earth in a cruise ship called the Cosmopolitan. ‘L’étrange retour vers Oméga’ has a great mystery plot and together with ‘La revanche des robots‘ it forms a great prelude to the one-story-finale, which consists of the last six episodes. ‘L’Atlantide’ is the second episode that takes place on earth, after ‘Terre!‘. It starts with Petit Gros’s departure. Old Maestro and Pierrot go visit some underwater cities, where they meet a strange captain, who appears to be from Atlantis. When confronted with Psi, whom he knows as his mother in a former life, he tells our heroes the story of Atlantis. This is another example of Barillé’s fondness of Erich von Däniken’s “the gods were cosmonauts” ideas, after ‘Les Cro-Magnons‘, ‘La planète Mytho‘ and ‘Les Incas‘. Unfortunately, this episode is rather boring, except for the Atlantean’s account, which is a classic story of greed, strive and doom. Because they have saved earth from an impending doom in ‘L’imparable menace‘, Pierrot, Psi and Petit Gros are allowed to go on holiday on earth, where they’re received as heroes. On earth, Maestro’s ancestor (from ‘Le long voyage‘) is their guide, and he takes our heroes to the countryside. Here he tells our heroes the history of earth from the 21st century onward. Barillé’s vision of the earth’s future contains some rather somber views on genetics, war, informatics and the climate. In the second half of this episode, the old Maestro takes Pierrot and Petit Gros into space, showing a solar ring, a cemetery of spaceships, and even an amusement park called ‘Barillé’s Land’. Because of its holiday theme, this short moves at a leisurely speed, and it is rather boring compared to the two episodes preceding it. However, even in this relaxed episode, there’s some conflict, when our heroes encounter a saboteur from Cassiopeia. Inconsistent design have always tortured the Il était une fois… series. 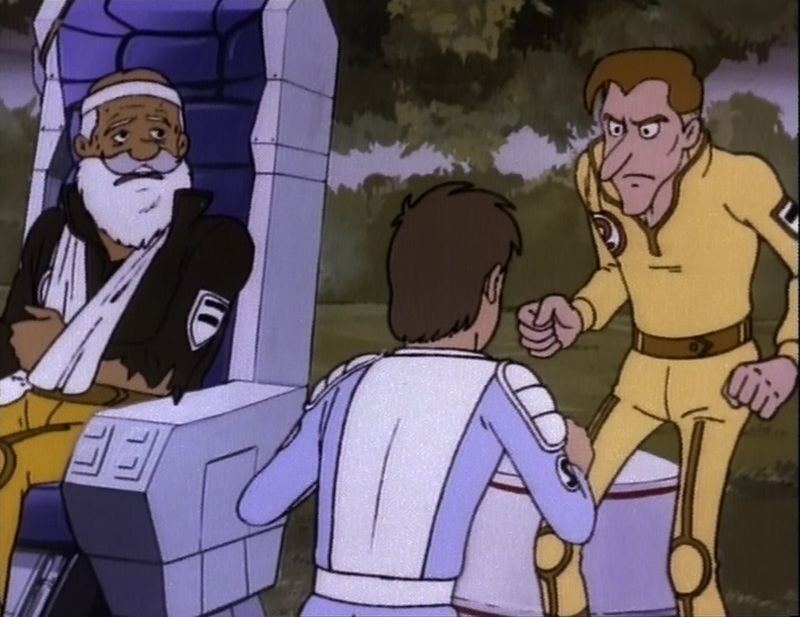 And in this episode, in certain scenes the drawings of our heroes are no less than terrible. This episode starts with Cassiopeia firing a deadly rocket to Earth in order to make Omega surrender to Cassiopeia unconditionally. So now Omega itself is at stake, with Earth as a hapless pawn in interstellar politics. Luckily for Omega, our heroes Pierrot, Petit Gros and Psi are still in the neighborhood of Jupiter, and they are the only ones who can stop the doomsday rocket in time. In fact, it’s the androids Psi encountered in ‘Les anneaux de Saturne‘ who had fired the rocket in the first place. The whole episode is one race against time, which makes it one of the most exciting episodes of the entire series. ‘Les anneaux de Saturne’ follows three boring episodes that rather stood on their own. How different this episode is! 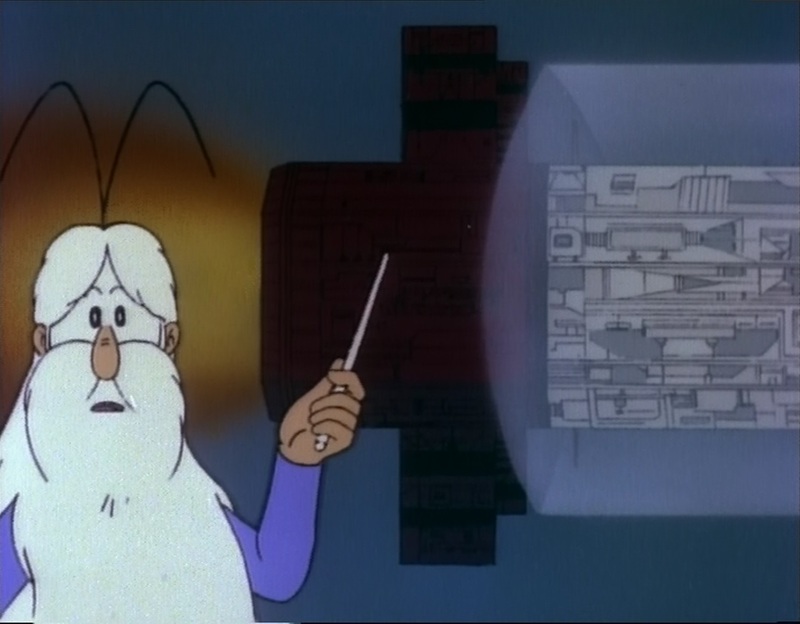 Like ‘La révolte des robots‘, ‘Les anneaux de Saturne’ is no less than a key episode. With this episode starts the finale of ‘Il était une fois… l’espace’, the long continuous saga that makes the series such a remakable effort. This episode is not only mysterious and exciting, but also educational on Uranus, Saturn, Jupiter and the asteroid belt. ‘Chez les dinosaures’ is the last of three vaguely educational episodes. It’s also one of the weakest episodes in the series. 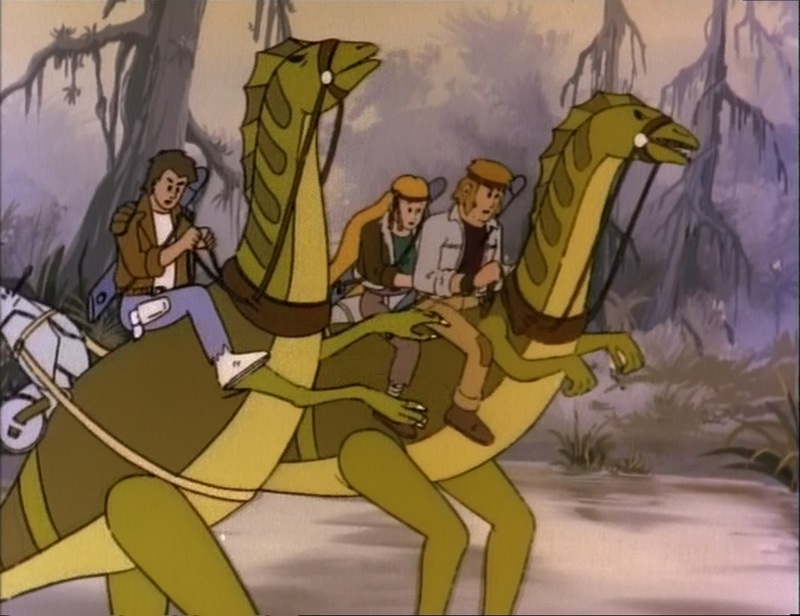 Pierrot, Psi and Metro now visit a planet inhabited by dinosaurs from the Jurassic period. Its educational value, however, is doubtful: Barillé’s theories on the end of the dinosaurs are no less than ridiculous, and the dinosaurs are designed and animated terribly. Furthermore, one grows tired of all these earth-like planets, populated by the same creatures that have roamed the earth, too (such planets occur also in ‘La Planète verte‘, ‘Les Cro-Magnons‘, ‘La planète Mytho‘, ‘Les géants‘ and ‘Les Incas‘). As if everywhere in space the same history occurs over and over again. 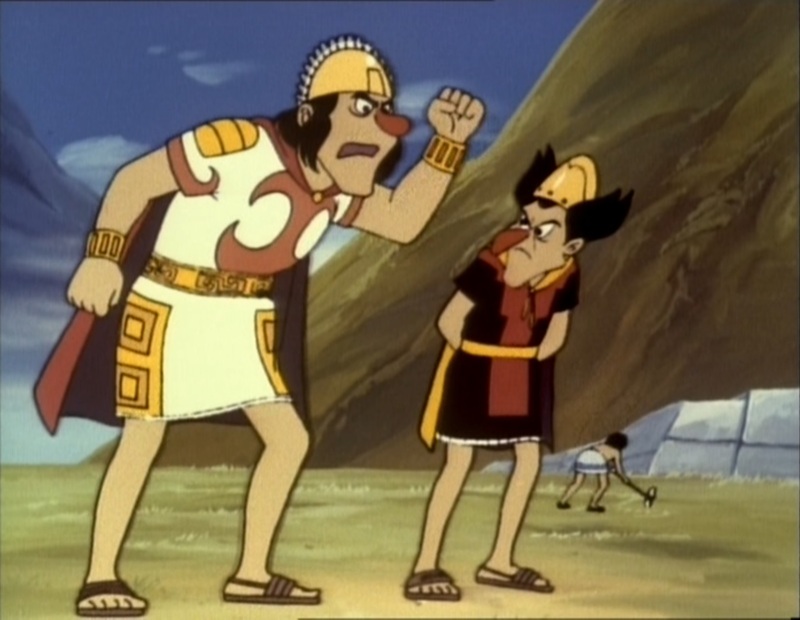 ‘Les Incas’ is the second of three adjacent episodes from ‘Il était une fois… l’espace’ that are more educational than entertaining, and which have nothing to do with the main story. This time, Pierrot, Psi, Metro, Legros and Maestro visit a planet on which the people live like Incas. Thus Barillé is able to tell us about the Inca society, which he does at great lengths. Only after three-fifths a story kicks in, when the friendly Inca society is about to be attacked by an unseen neighboring people, and our heroes refuse to help them in the battle. The Inca’s own Teigneux and Nabot trick our heroes to get hold of their weapons, but Metro once again saves the day. This slow and tiresome episode also features an Erich von Däniken-like story about earlier visitors, Astronauts, who turned into Gods, just like in ‘La planète Mytho‘. ‘Les géants’ is the first of three adjacent and vaguely education episodes that have nothing to do with the main story. In ‘Les géants’ Pierrot, Psi and Metro visit a huge planet, which, like almost every other planet in the Barillé universe, is an exact copy of earth, this time only bigger. 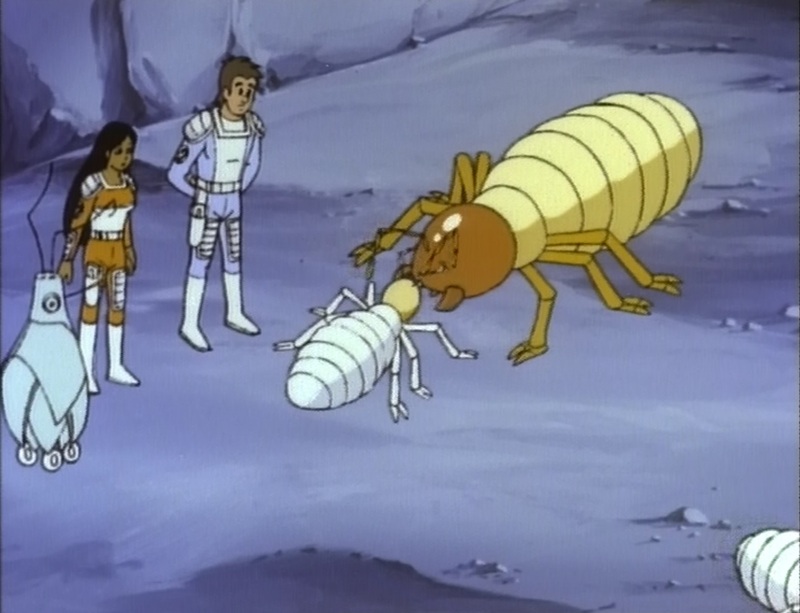 On this planet our heroes encounter huge animals, like a giant caterpillar, a monstrous spider and a very cartoony rat. 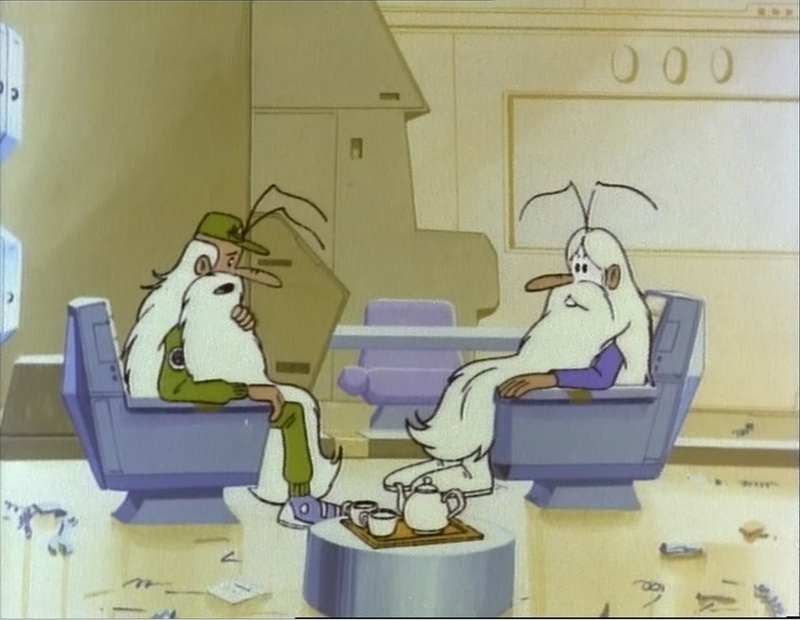 Most of the episode, however, they are trapped in a termite colony. Thus, Barillé is able to tell us more about these little insects, which he does mostly through a lecturing Metro. There’s practically no story, and most of the time Pierrot and Psi are trying to get out of the colony. This fact and the lectures render one of the most boring episodes of Il était une fois… L’espace. It seems this and the following two episodes were made to sell the series as an educational one. However, ‘Il était une fois… l’espace’ remains far less educational than the previous ‘Il était une fois… l’homme’ or indeed, the subsequent ‘Il était une fois… la vie’, and its charm lies mainly in Barillés story. Unfortunately, ‘Les géants’, ‘Les Incas‘ and ‘Chez les dinosaurs‘ are no part of that and form the low point of the entire series. This episode starts immediately where ‘La planète déchiquetée‘ has left off: the space vessel ‘Ursus’ has crashed on, luckily, an earth-like planet. Unfortunately, its captain is ill, and our heroes have difficulties with the second in command, the skeptical and cowardly lieutenant Sanders. While Metro is used for all kinds of reparations, Pierrot and Psi go on two expeditions. On the first they encounter strange lifeforms, like walking trees, spider-like aliens, green gorillas, and friendly little black people called Ptax. Like the lizards in ‘Les Sauriens‘, the Ptax are telepathic and they help our heroes against the green gorilla creatures. On the second expedition, our heroes go searching for metal, but what they find is a military ship from Cassiopeia… Aware of the threat, Pierrot and Psi hurry back to the camp, only to learn the captain has died. Only when a riot breaks out between Pierrot and Sanders, Omega comes to the rescue. The animation is painstakingly slow in this episode, and there’s more urge in the dialogue than in the action. Because of these shortcomings the episode is only half as captivating as it could have been. 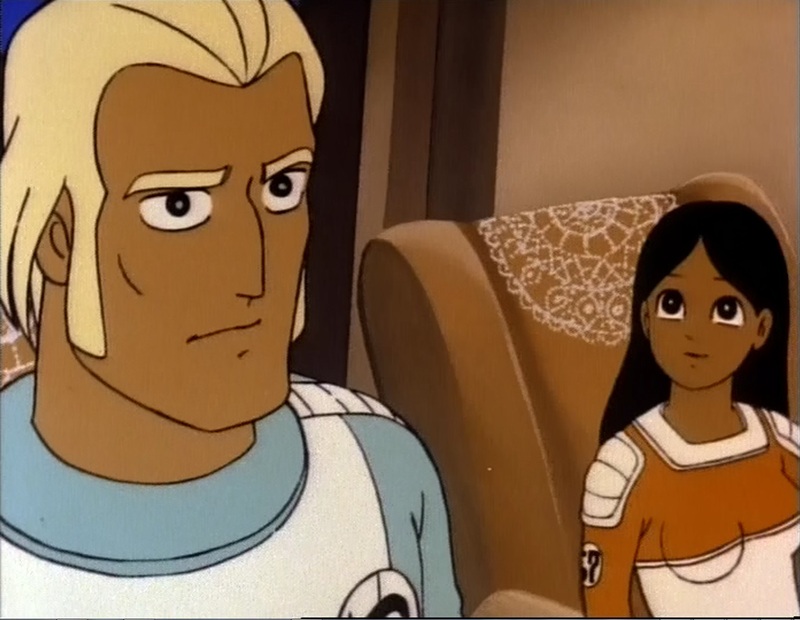 Episode 9 of ‘Il était une fois… l’espace’ is closely tied to episode 10 and 11, constituting the first episode-exceeding story within the series. It’s also one of the more political episodes. Indeed, its first half is about politics only. 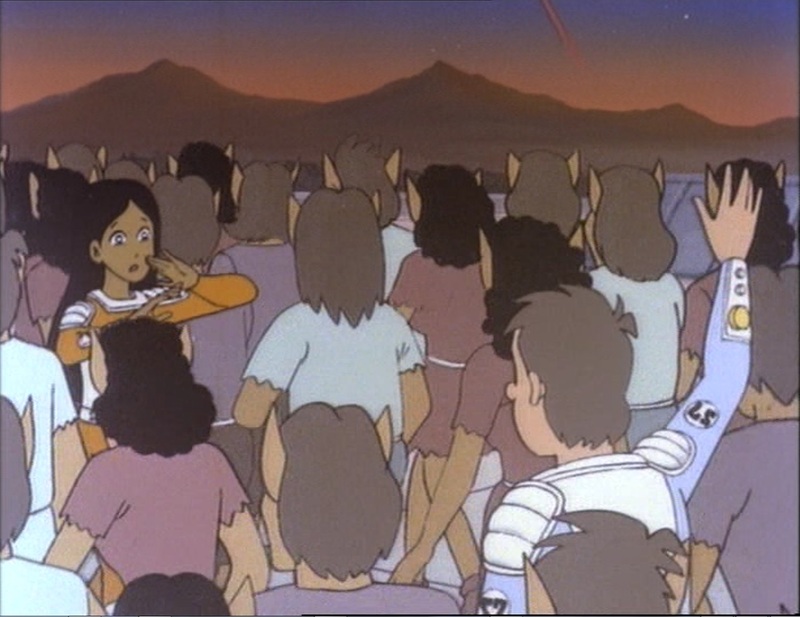 It starts with general Teigneux (Pest) reflecting on the past, how he failed to colonize planets because of Omega, referring to the events in episodes 2-6. Then consul Le Nabot (Dwarf) shows him the tapes from earth he had stolen in the previous episode. The images of earth shows Barillé’s cynical view on the earth’s future: 30 billion people, many of which overfed, a lot of pollution, age-long traffic jams (reminiscent of those from Halas & Batchelor’s cartoon ‘Automania 2000’ from 1963), and a pride in producing weapons. After watching these images, Cassiopeia plans to invade earth. After this long introduction, our heroes are sent to Cassiopeia to find out what their plans are, but they’re immediately captured and sent into prison. The second half of this episode consists therefore of a classic prison break, with a starring role for the rather matter-of-factly Metro. Our heroes eventually escape using the same meteor trick the Millennium Falcon did in ‘The Emperor Strikes Back’ (1980), one of the numerous influences of George Lucas’ films on Barillé’s series. 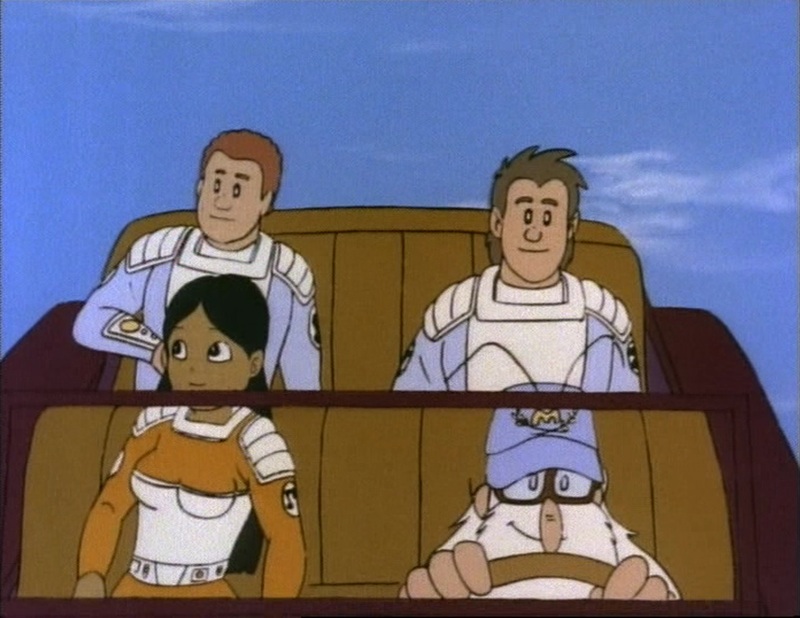 ‘Le long voyage’ is a nice episode about space travel. 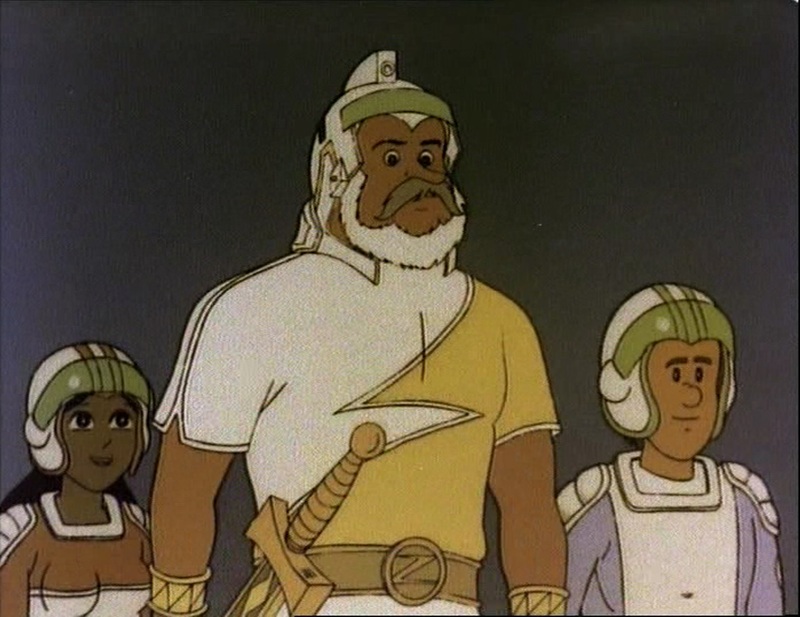 Star of the episode is an ancient forefather of Maestro who, after a journey of more than a 1,000 years, awakes near Omega, only to be greeted by descendants of humans who had made the trip after him, with better, larger and faster spaceships. 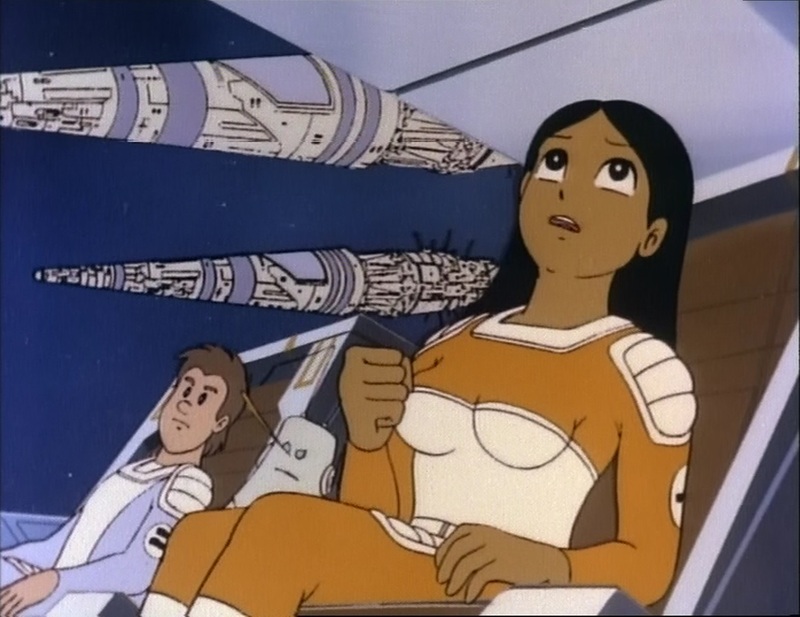 This episode excels in beautiful backgrounds and designs, especially of the spaceships. Highlight, however, are the ancient Maestro’s fantasies about extraterrestrial life, just before he encounters the all too familiar inhabitants of Omega. With ‘Le long voyage’ we firmly return to the main story of ‘Il était une fois… l’espace’. The strange incident from episode 1 is mentioned again, and in this episode we learn that earth still exists, ultimately leading to our heroes visiting their mother planet in episode 17. It also contains an unclear mystery about a hijacked ‘train’, indicating more troubles to come. Moreover, this episode shows Psi’s psychic powers in full, saving Pierrot who has become adrift in space. Maestro’s ancestor is a great character and he would return to the screen in episodes 17 (‘Terre!‘) and 18 (‘L’Atlantide‘). In this seventh episode of ‘Il était une fois… l’espace’ our heroes Pierrot, Psi and Metro land on a planet, where the survivors of a stranded spaceship play Gods. This episode toys with Erich von Däniken’s ideas about the gods having been astronauts (Barillé would revisit that idea in ‘Les Incas‘). The stranded people are like the gods of the ancient Greek, sharing their names and habits. The commander of the ship, Zeus, is a strong and valiant man, but he is also selfish, autocratic, and paternalistic. He keeps the mortals, the original humans populating the planet, ignorant and miserable. Pierrot and Psi disagree with the commander’s choice, and secretly give the humans bricks, the wheel, the sail, music and fire, thus turning them into some Prometheus and Athena, and showing Barillé’s personal political view. 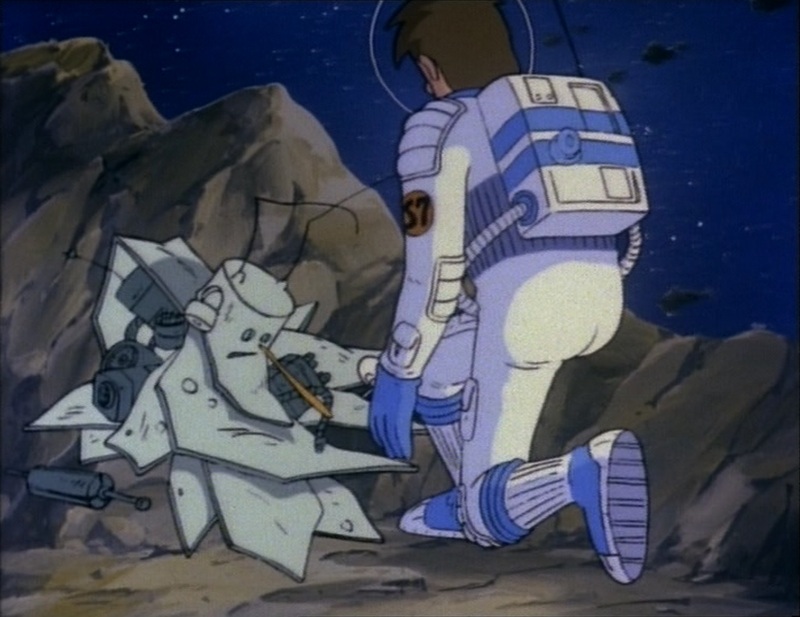 Unlike its predecessor, ‘La révolte de robots‘, ‘La planète Mytho’ is more or less a stand-alone episode. It is also vaguely educational, telling kids a little about Greek mythology, although this is much easier to understand and to enjoy by the educated viewer than by the intended audience. Apart from the Gods, Barillé shows us three Greek myths: Peleus and Thetys, Pan and Syrinx, and Eris’s apple of discord. The bronze giant Talos is transformed into a robot. Because of the use of Greek mythology, the overall episode is inconsistent, hard to follow and slow. One wonders what Barillé’s aim was with this entry: did he want to educate or did he want to tell about political ethics?